Please note: The digital edition does not include 1 of the 41 images that appear in the physical edition. Although the death of the small town has been predicted for decades, during the 1990s the population of rural America actually increased by more than three million people. In this book, Sonya Salamon explores these rural newcomers and the impact they have on the social relationships, public spaces, and community resources of small town America. Salamon draws on richly detailed ethnographic studies of six small towns in central Illinois, including a town with upscale subdivisions that lured wealthy professionals as well as towns whose agribusinesses drew working-class Mexicano migrants and immigrants. She finds that regardless of the class or ethnicity of the newcomers, if their social status differs relative to that of oldtimers, their effect on a town has been the same: suburbanization that erodes the close-knit small town community, with especially severe consequences for small town youth. 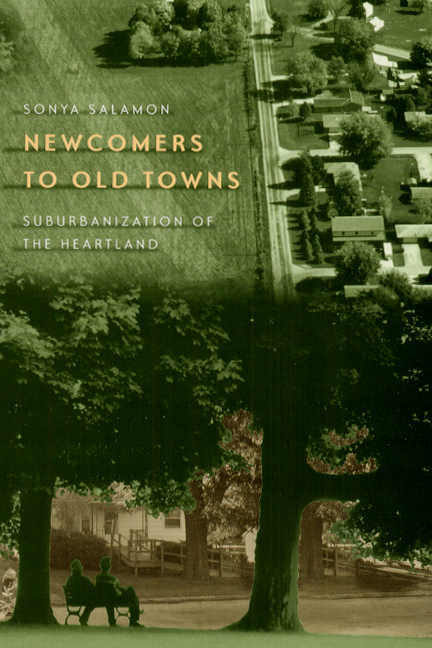 To successfully combat the homogenization of the heartland, Salamon argues, newcomers must work with oldtimers so that together they sustain the vital aspects of community life and identity that first drew them to small towns. An illustration of the recent revitalization of interest in the small town, Salamon’s work provides a significant addition to the growing literature on the subject. Social scientists, sociologists, policymakers, and urban planners will appreciate this important contribution to the ongoing discussion of social capital and the transformation in the study and definition of communities. 9. Whither the Rural Heartland?